Ingrid is a Certified Cat Behavior Consultant (CCBC) through the IAABC, The International Association of Animal Behavior Consultants. 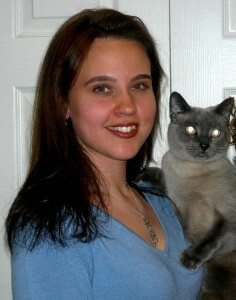 She is also a veterinary technician and feline groomer formerly of The Cat Clinic of Roswell. Ingrid has been working exclusively with cats since 1999 and has had the opportunity to attend many continuing education courses all over the country, including the first ever all feline behavior conference hosted by the American Association of Feline Practitioners (AAFP). She has now moved on to speaking at the AAFP! She has spoken at different humane society events on common behavior challenges, hosted group education seminars for the volunteers at Good Mews, and also hosted discussions for her colleagues through the IAABC on her most passionate topic, environmental enrichment for indoor cats. Ingrid has been interviewed for numerous publications both in print and online including Cat Fancy magazine, thedailycat.com, and The Atlanta Journal Constitution. The AJC also utilized Ingrid’s feline knowledge to answer an online question and answer column called “Ask the Expert” at AJCpets.com. Ingrid’s home has been featured in Cat Fancy magazine showcasing all of the feline friendly accommodations that she has made. Perhaps one of the most exciting opportunities was her home, cats, and environmental enrichment expertise being featured on Animal Planet’s Cats101 show, the episode featuring the color-point short hair. You may also catch clips of her feline family in the Animal Planet’s Must Love Cats theme song and on various other programs. Ethics, quality, and compassion are the aspects of care that are of utmost importance to Ingrid. Whether performing a dental cleaning, treating a hospitalized patient, or giving a cat a bath, Ingrid feels that you must treat each patient as if it were your own pet. Ingrid is a skilled surgical assistant, trained laboratory technician, and a fastidious groomer. She will leave your kitty looking like she “just stepped out of the salon.” Additionally, she provides a wealth of knowledge and insight into common challenges that clients may be experiencing with their pets and always has another idea if one or several techniques have not worked. Ingrid offers behavior consultations in her free time. You can learn more about the products and services she offers via her website Fundamentally Feline. She specializes in cats with litter box avoidance, aggression (human and animal directed), inappropriate scratching problems and is an expert in environmental modifications to best meet your cats' needs. While these concerns are the most common reasons clients seek her assistance, Ingrid is able to help with a whole spectrum of behavioral issues. Due to her medical background in veterinary medicine she is also able to work side by side with the veterinarian to simultaneously address medical and behavioral components of a cats behavior challenges. In home behavior consultations and phone consultations are available. For more info about a behavior consultation please visit the consulting page of Ingrid's website. Additionally, Ingrid also provides consultations on feline friendly décor, to meet your cats’ needs with attractive interior design in mind. Custom built vertical space to attractively increase your feline’s usable territory is also available. Please call for a home consultation and come by Paws Whiskers and Claws to see her line of scratching posts, feline foraging toys and custom made litter boxes. If you need help with your kitty, please fill out the behavioral questionnaire or call 770-579-6001.